System.InvalidCastException: Conversion from string "17841515:07:22:08:48:13.1::Pinky" to type 'Double' is not valid. ---> System.FormatException: Input string was not in a correct format. I just ran an ISA and one player's combat time was 12-13 seconds longer than anyone else's - looking at the logs I suspect it is his Nimbus Pirate Distress calls having Plasma fire on them, but I could be wrong. System.ArgumentException: Font 'Century Gothic' cannot be found. Not sure if this counts as a bug per se (since this is a reporting error not unique to SCM), but Fly Her Apart incoming damage is misreported as incoming heals. Not a bug per say, but after/during the last autopatch, avast (according to virustotal, only avast) is flagging the exe as suspicious. + Downloading http://www.theamateurscientist.info/parser/Application Files/STO Combat Meter_1_0_0_60/STO Combat Meter.exe.deploy did not succeed. + The underlying connection was closed: The connection was closed unexpectedly. * [27-Jul-15 2:00:37 PM] : Activation of http://www.theamateurscientist.info/parser/STO%20Combat%20Meter.application has started. * [27-Jul-15 2:00:47 PM] : Processing of deployment manifest has successfully completed. * [27-Jul-15 2:00:47 PM] : Installation of the application has started. * [27-Jul-15 2:00:47 PM] : Processing of application manifest has successfully completed. * [27-Jul-15 2:00:52 PM] : Found compatible runtime version 4.0.30319. * [27-Jul-15 2:00:52 PM] : Request of trust and detection of platform is complete. - Downloading http://www.theamateurscientist.info/parser/Application Files/STO Combat Meter_1_0_0_60/STO Combat Meter.exe.deploy did not succeed. - The underlying connection was closed: The connection was closed unexpectedly. Message saying that the log is in use and cannot be deleted until /CombatLog 0 is entered or STO is closed. After some initial investigation, it looks like the parser is not running w/ elevated permissions. Since Program Files is a super-protected directory, Windows is probably blocking access. + Downloading http://www.theamateurscientist.info/parser/Application Files/STO Combat Meter_1_0_0_61/STO Combat Meter.exe.deploy did not succeed. * [7/29/2015 12:07:38 PM] : Activation of C:\Users\Autumn\Desktop\STO Combat Meter.appref-ms| has started. * [7/29/2015 12:07:38 PM] : Performing necessary update check as specified by the deployment. * [7/29/2015 12:07:39 PM] : Consuming new update. * [7/29/2015 12:07:41 PM] : Installation of the application has started. * [7/29/2015 12:07:41 PM] : Processing of application manifest has successfully completed. * [7/29/2015 12:07:41 PM] : Found compatible runtime version 4.0.30319. * [7/29/2015 12:07:41 PM] : Request of trust and detection of platform is complete. - Downloading http://www.theamateurscientist.info/parser/Application Files/STO Combat Meter_1_0_0_61/STO Combat Meter.exe.deploy did not succeed. I get this when trying to clean the log. It can't access the file. Not sure if this is a problem with CLR or a user-error. Please let me know. * [2015-07-31 13:06:45] : Activation of C:\Users\o_O\AppData\Roaming\Microsoft\Windows\Start Menu\Programs\STO Combat Meter\STO Combat Meter.appref-ms| has started. * [2015-07-31 13:06:45] : Performing necessary update check as specified by the deployment. I got this too after upgrading to win 10, hitting continue allows the parser to continue working, albeit having to point to the log again. * [03-Aug-15 16:10:20 PM] : Activation of C:\Users\Dart Dukii\Documents\Desktop\STO Combat Meter.appref-ms| has started. * [03-Aug-15 16:10:23 PM] : Performing necessary update check as specified by the deployment. * [03-Aug-15 16:10:29 PM] : Consuming new update. * [03-Aug-15 16:10:32 PM] : Installation of the application has started. * [03-Aug-15 16:10:33 PM] : Processing of application manifest has successfully completed. * [03-Aug-15 16:10:33 PM] : Found compatible runtime version 4.0.30319. * [03-Aug-15 16:10:33 PM] : Request of trust and detection of platform is complete. + Exception occurred loading manifest from file STO Combat Meter.exe: the manifest may not be valid or the file could not be opened. + File STO Combat Meter.exe is not a valid Portable Executable (PE) file. + Operation did not complete successfully because the file contains a virus. * [8/5/2015 6:35:36 PM] : Activation of C:\Users\Autumn\AppData\Roaming\Microsoft\Internet Explorer\Quick Launch\User Pinned\TaskBar\STO Combat Meter.appref-ms| has started. * [8/5/2015 6:35:37 PM] : Performing necessary update check as specified by the deployment. * [8/5/2015 6:35:45 PM] : Consuming new update. * [8/5/2015 6:35:52 PM] : Installation of the application has started. * [8/5/2015 6:35:52 PM] : Processing of application manifest has successfully completed. * [8/5/2015 6:35:52 PM] : Found compatible runtime version 4.0.30319. * [8/5/2015 6:35:52 PM] : Request of trust and detection of platform is complete. - Exception occurred loading manifest from file STO Combat Meter.exe: the manifest may not be valid or the file could not be opened. - File STO Combat Meter.exe is not a valid Portable Executable (PE) file. - Operation did not complete successfully because the file contains a virus. 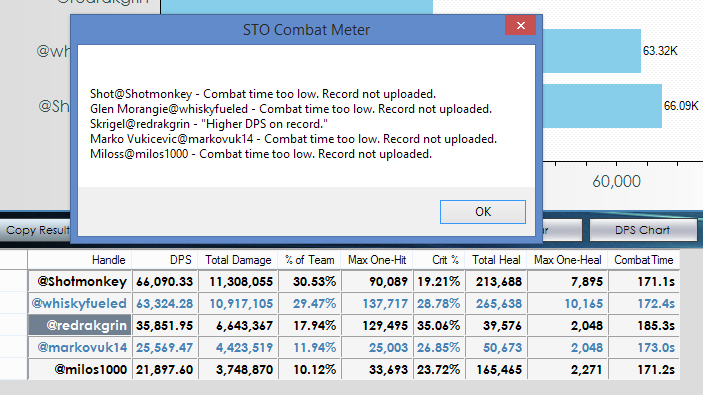 * [8/6/2015 10:39:49 PM] : Activation of C:\Users\Autumn\Desktop\STO Combat Meter.appref-ms| has started. * [8/6/2015 10:39:49 PM] : Performing necessary update check as specified by the deployment. Emptying ...\apps\2.0\ and forcing a re-install at least allows me to get it open again, but as soon as I close the program, the problem persists. 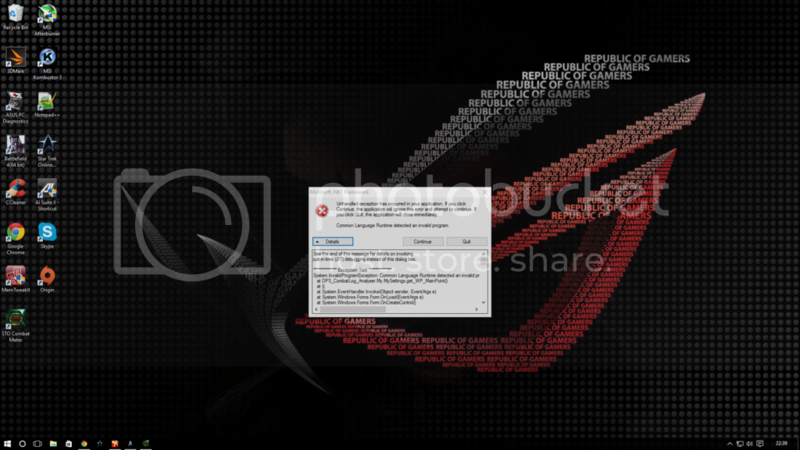 I get an error on starting the tool with windows 10, I attached a screen shot of the message.But the tool still functions as intended. Hi - The new DPS league Table is wonderful except for a couple items. I particularly like the ability to break out by career field. The problems are with the ranking when the search function is used. If a search is made with a blank field, the results appear to be sorted by reverse alphabetical order on handle name, then the rankings are applied. If you re-sort the list by clicking on a column, it sorts again but the rankings remain attached to each record from the original list. This occurs also when a search field is entered. Rather than a league ranking, an arbitrary ranking (reverse alpha on handle name) is assigned to the subset that matches the search field. A simple reassignment of the DPS value as the sort field will take care of the ordering issue. If you want to have the ranking reflect position within the league I would recommend a couple things. First, you could produce the table as you're currently doing for all or a career field generating the ranks on the fly and then either keep those values in a hidden table which could be used to fill in the displayed table based on the search field, or if your table allows multiple selection, you could use the search function to simply select (highlight) those entries that match the search field. If you intended to allow sorting the displayed table by clicking on the columns, there are a couple other issues. The first is that the columns resize on the fly. This means the width is adjusted to fit the largest field in each column as displayed on the first page of the table. The biggest jumps are coming from the character and handle fields since they have the most variation. Since the table itself seems to be a fixed size with a left/right scroll bar anyway, I suggest assigning a fixed size to each column. The second is that all the table fields sort the fields as if they were all text strings so if you sort by the rank column you get 1,10,100,101-109,11,110,111-119,... rather than being sorted by numeric value.